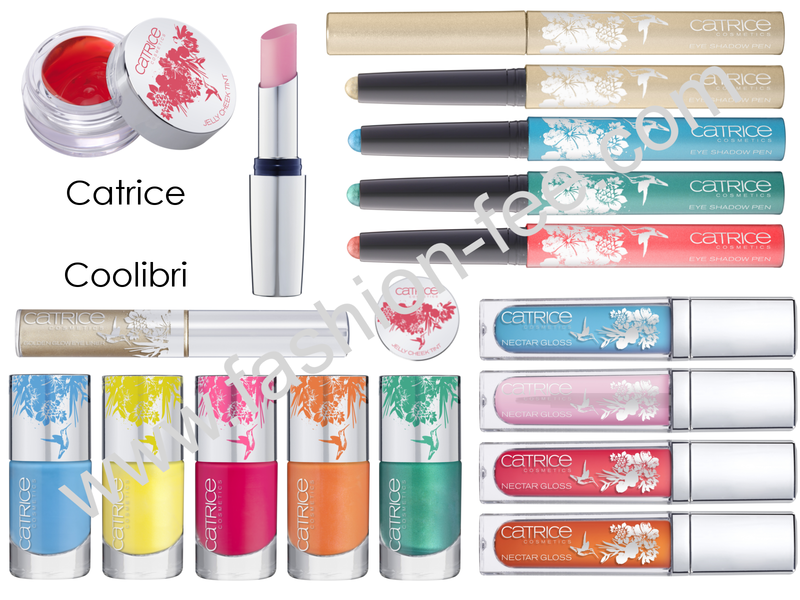 Today I want to talk about Catrice's latest LE, called Coolibri. It's a summer-themed one! This LE contains 1 blush jelly, 1 lip balm, 4 eyeshadow sticks, 1 eyeliner, 4 lipglosses and 5 nail polishes. Here *click* you can see the promo pics. The blush jelly comes in a little pot and it's a red color. It's super duper sheer and thin and jelly-like, you have to feel this consistency :D Unfortunately a lot of bloggers wrote negative reviews about it, saying it's too sheer, so I left it at the store. The lip balm is just a regular light pink lip balm that is really sheer. The packaging of it is so so cute, I love the print and everything! I seriously was tempted to buy it, but not for the price of 5 Euros. That's a little too much for a lip balm in my opinion! The eyeshadow sticks are all shimmery colors, and they are really fun for summer. They all seemed to be very pigmented, and I got myself the champagne colored one, called C01 Precious Nectar. It's opaque and super pretty! Can't wait to wear it! The eyeliner is a golden one, not so much my taste, but matching for a summer LE. The lipglosses are all very sheer again. They looked nice, but I have enough sheer glosses...the blue one doesn't look blue on your lips, btw, it's one of those glosses that make your teeth look whiter because of the blue tones. The nail polishes are all bright and fun colors, as far as I know all with a shimmer. I bought one of them, a really pretty green with a glowy shimmer. It tends to have some brushstrokes, but it's opaque with 2 coats and I like it a lot :) It's called C05 Virgin Forest. I love what you got. Those eyeshadows strongly remind me of the Kiko ones. Do tell us how waterproof and crease-resistant they are. yes, I didn't think of that at first, but you're so right, they look like the Kiko ones! Of course I will, just gotta find the time to try them!